Well, here's the scoop for you soon to be brewmasters. 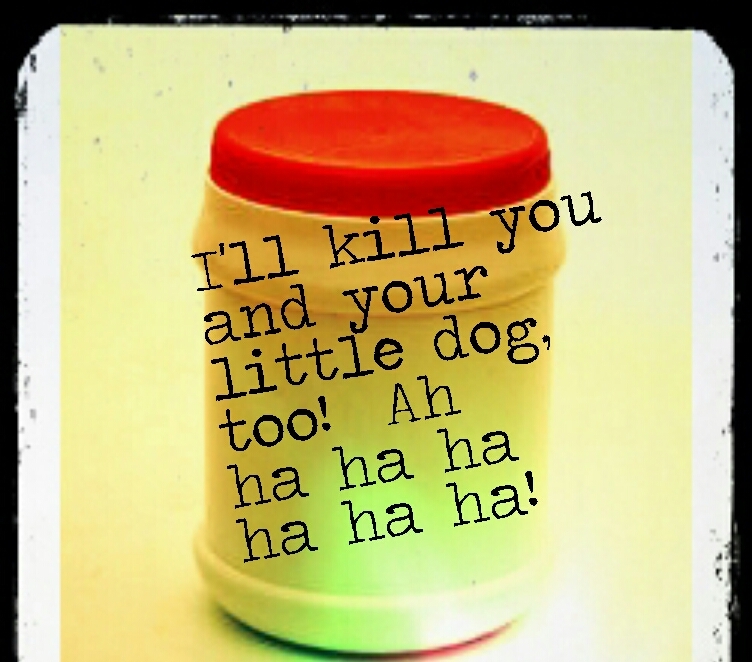 As far as price - if you go to the store and get some, the prices will vary. At a local health food store, half of a gallon costs $28.00. If you buy the 16 oz. (I think? Or is it 12?) of GT's it is about $4.99. If you make a gallon at home, it will cost you the price of 3 tea bags and 1/2 cup of organic (or cane) sugar (plus water, if you want to count the price of running a gallon of water out of your sink). Okay, now on how to make it. Did you just say, grrreat, where the heck am I gonna get a scoby from? Well, honestly, you can get them on ebay, I think. Now you've heard it all, right? Well, besides that, you can get it at the Kombucha Kamp website. They'll ship them to you. If you know someone who makes kombucha, just get one from their scoby hotel (you can research that one, if you want - it's just a place to keep some backups since they double and soon you'll have more than you need). Okay. Now, you've got your stuff. Ready? 1. 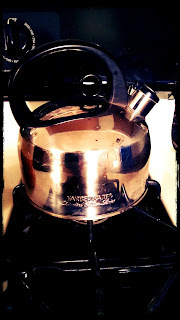 Boil a bit of your purified water on the stove. 2. In your squeaky clean jar (but not with antibacterial soap - you don't want to kill your scoby - use vinegar to clean if you haven't got anything else), put in 1/2 cup of organic or can sugar and three black tea bags (no flavors - just straight black tea). 3. Once the water is boiled, pour in a few inches of it onto your tea bags and sugar. Let it steep and let the sugar dissolve for a few minutes. 4. Remove tea bags. Put them in your compost bin. 5. Fill the jar with cold, purified water so that you bring the contents to room temperature. Basically you have some sweet tea in a jar now. 6. Wash your hands with castile soap or vinegar (NOT ANTIBACTERIAL - I mean, you're not the kind of person to have antibac soap, are you? Dude. C'mon, pitch that endocrine disrupting poison!). Shake off, leave wettish. Lovingly grasp your stingray, I mean, scoby and gently lay her/him into your room temp tea. 7. Add your cup-ish of kombucha to the mix. 8. Cover your jar with your washcloth and a rubber band to go around the opening. 9. Put in a warm, dark place (72-79 degrees) for a week. In the summer, it takes about 5 days until it's ready and in the winter, it takes about 10 days. Adjust according to your temperature. 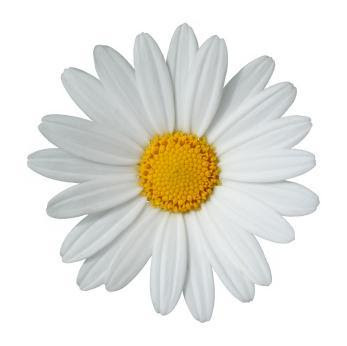 DO NOT put it in a humid place - the bathroom, under your sink - etc. You can grow mold if your baby scobes gets subjected to too much humidity. There's only a couple ways to kill your scoby, so pay attention. 1. It's alive so DO NOT put it in hot water. You will kill it. 2. It's a probiotic bacteria so DO NOT use antibacterial soap on anything it touches. You will kill it. 1. Does the kombucha look honey colored? If so, good. 2. Do you see any bubbles under the scoby along the edge of the glass? This is good. It means that fermentation has taken place. 3. Lift your washcloth away and look at your scoby. Does everything look normal? Does it look thicker? This is good. Does it have brown things hanging under it? This is totally normal too. Does it have weird spots on it? That's not good. Some people get mold. It is not special mold. It is that regular old bread crust mold you know and hold oh-so-dearly to your heart. Don't drink it if you've got mold. Dump it and start over (including the scoby). 4. Next test: get a straw. 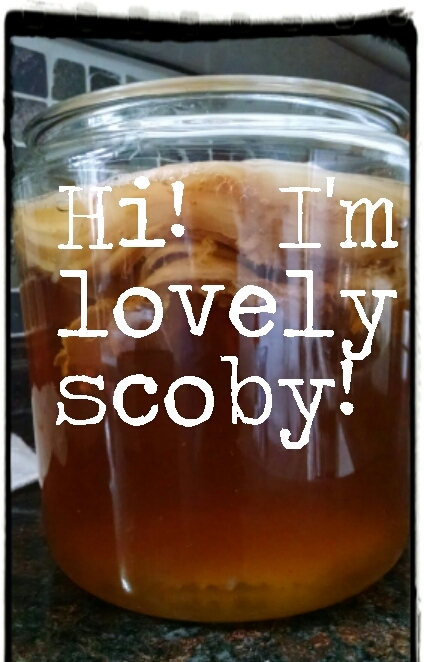 Shove it past the scoby, lift a bit up by using the stick-your-thumb-over-the-opening-and-lift-method. Dump the strawful of liquid onto your tongue. Does it taste kombucha-ey? Or does it taste like tea still? If tea-ish, cover it back up and leave it another day or two or three. If too vinegary, you let it go too long. In the middle of those two tastes is your lovely kombucha flavor. It's like Little Red Riding Hood (This drink is too sweet! This drink is too sour! But this is one is JUST right!). 5. If it's all ready, wash your hands with castille soap or vinegar and lift out your scoby to a glass or ceramic receptacle for a moment while you make more. 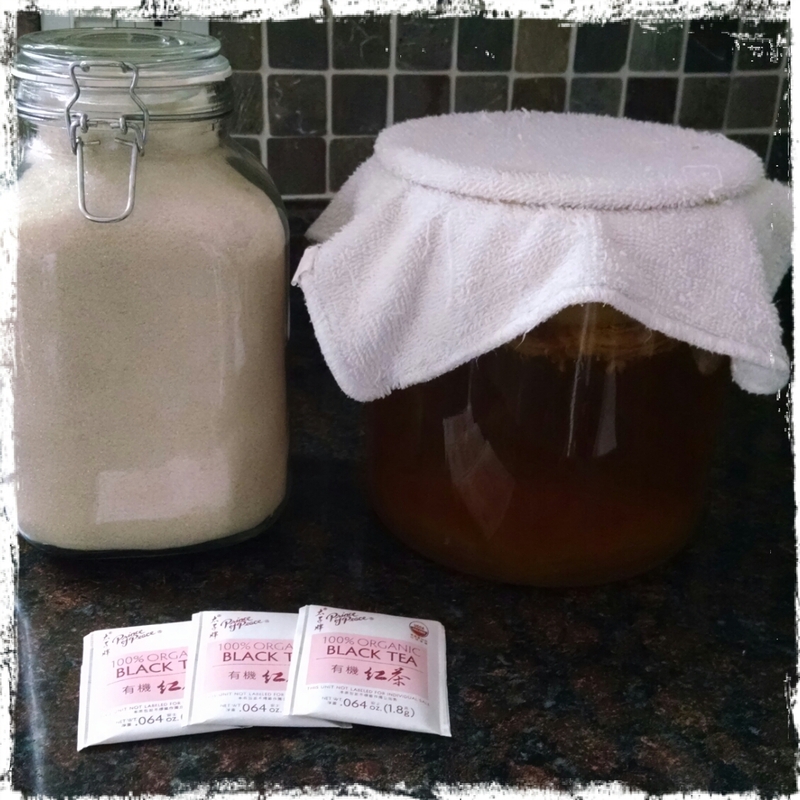 Pour a cup or so of your good, new kombucha over the scoby to keep it happy. 6. Use a (stainless steel) funnel to pour out your kombucha if you're going from a big jar opening to a smallish one. 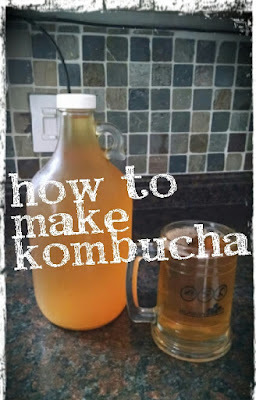 Stick the freshly-made batch of kombucha in the fridge in a glass container. 7. Make a new batch! Some people have freezing houses. You may have to wait longer than 2 weeks for your brew to work. I've told you that you can kill your scoby, but I need to tell you that your kombucha can kill stuff too - it can kill plastic or metal. DO NOT EVER USE PLASTIC OR METAL for kombucha. It will eat the plastic, "Mmm, yum! Plastic!" It will rust metal. I hope that this has been helpful and informative for you. If you are more of a visual learner, check this guy out.